I used to commute daily to my office near Anushakti Nagar from my home, TIFR colony at Navy Nagar, Colaba, by local train using the harbour line (from CST to Mankhurd and return). This happened for the last 15 years. One day, on May 2nd 2011, I went to a cycle shop and purchased a hybrid citi cycle (Trek 7100). From that day till today, except when I wasn’t in the city, commuting daily to my office. The track is about 26km or 23km depending on which route I take. 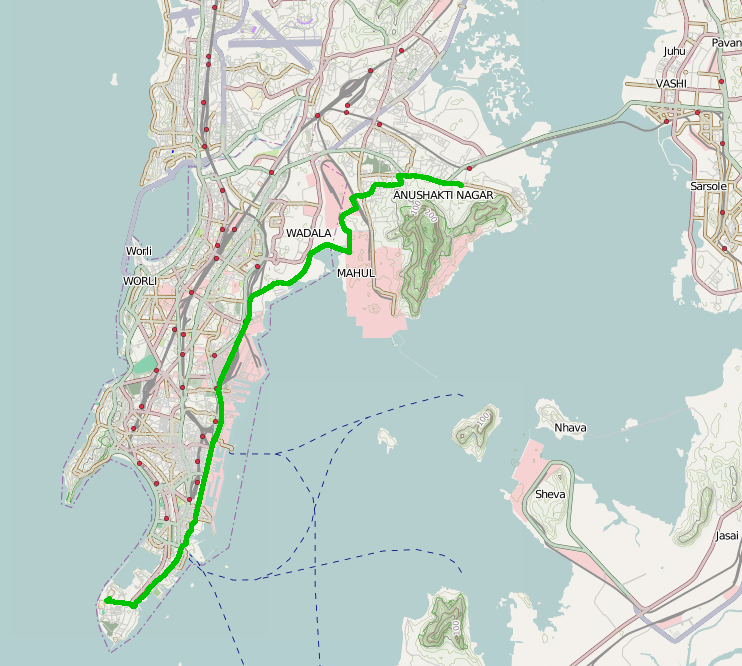 I am covering this distance within 1:15min with an average speed of 19km/hour without much effort. The picture is one of the routes I use for my commute. What I realised from this experience is that Mumbai is a flat city. The change in altitude in my entire stretch of 26km is only 60meters. This makes the city an eminent place to commute by cycles. I did it in the hottest month of May, and also during the rains. Cycling in the rains is certainly less tiring than the humid and hot weather of Mumbai. Having tested my endurance in both the hottest and wettest weathers, I am hoping to continue to the rest of my life cycling. I will write once in a while my experiences. Happy cycling!